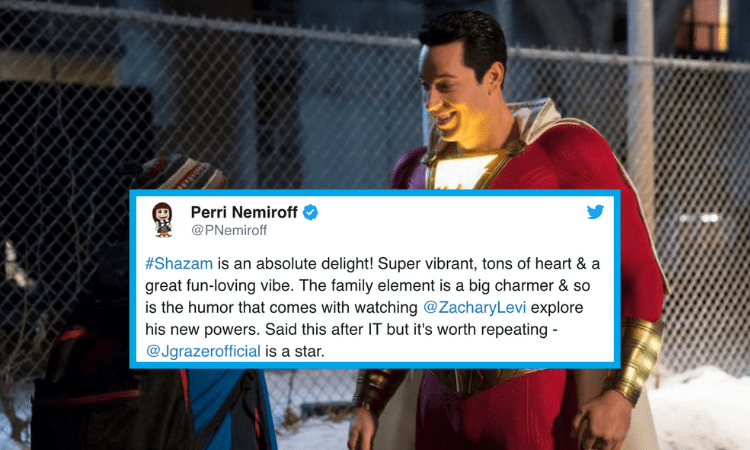 The first reviews for DC’s upcoming Shazam have finally hit Twitter and it looks like the movie is going to be well worth a large slushie and a bucket of popcorn. Following the success of Wonder Woman and Aquaman, critics are absolutely raving about the Zachary Levi-led superhero film, praising its heart, charm, supporting cast, and childhood nostalgia. The film follows Billy Batson (Asher Anger) as a streetwise 14-year-old foster kid, who after a stranger encounter, is able to turn into the adult superhero known as Shazam (Levi). The film also stars Jack Dylan Glazer (It), Cooper Andrews (The Walking Dead), Mark Strong (Kingsman), Grace Fulton (Annabelle), and Djimon Hounsou (Guardians of the Galaxy). Check out the instant reviews below! Shazam hits theaters on April 5th! Check out the full trailer below.